December marks the end of my second term of office as president and I’m looking forward to the start of a new term of office in January. In the span of four years we’ve grown our Local from 283 members to 635 strong. This was accomplished with a committed board that feels strongly about advancing the cause of musicians in our community. Some of the highlights of the past four years include our two business of music seminars held at the Spectator, the resolution of the Opera Hamilton fiasco that resulted in $20,000 being paid out to our musicians thanks to our lobbying city council successfully. In this process we managed to win friends on city council and further established the reputation of Local 293. This year with the Pan-Am Games in town we managed to triple the amount of funds available for MPTF gigs around the city. Funding was provided to the Cactus Fest, It’s Your Festival, Downtown BIA Promenade, BIA Pan Am Promenade, the Waterfront Trust Music Series and the Jackson Square Rooftop Concerts. A special thanks goes to MPTF Trustee Dan Beck who made it all possible. Extra special thanks to Brent Malseed who spent umpteen hours doing the paperwork, taking pictures and all that goes into making these events happen. As a matter of fact, Brent does a great deal to make the office run as smooth as possible always going the extra mile to see to it that our members are well looked after. We’re particularly proud to say we’ve managed to get six Lester Petrillo Fund grants for our members who fell ill and couldn’t work. I think it’s nice to know that when the chips are down our members can count on us to help. We’ve reached out to other labour organizations such as The Workers Arts &Heritage Centre and the Hamilton and District Labour Council which in turn has strengthened our solidarity with the labour movement and provided more jobs for our musicians as they are committed to hiring union members for their social functions. We also marched in the Labour Day Parade for the first time in decades. We’re looking forward to having a larger presence in the parade next year with more members participating. Over the years we’ve made donations to the King Biscuit Boy Scholarships for Mohawk College students in the music program. We’ve also made donations to the Hamilton Spectator Summer Camp for Kids Fund as part of our community partnership with the Spectator. Lastly, I’d like to thank Steve Sobolewski and Lorne Lozinski for their many years of service to the local as they have both opted not to run again for the board. Replacing them will be Glen and Brenda Brown and we look forward to their participation in the new year. Executive Board 2016/2017 – I would like to thank the membership for their vote of confidence in my nomination and acclamation for another term as Secretary-Treasurer and Delegate to AFM Conventions & Conferences. I would also like to thank Lorne Lozinski and Steve Sobolewski for the years of service as Executive Board Members of Local 293. Both Lorne and Steve decided not to run for re-election this year. Congratulations to all board members who were re-elected and to Glen Brown and Brenda Brown as new members to the Local Executive Board. Membership – Our membership now stands at 636 members. This is an increase of 11 new and reinstated members since the last issue of the Libretto was published in October, 2015. I would like to take this opportunity to welcome all the new and reinstated members as listed in the “Membership Matters” section on page 9 of this Libretto. Recruitment and Retention is a priority for this local and to achieve this we strive at providing quality service and advice to all members. An article was published in the September 2015 issue of the International Musician, written by Tina Morrison, AFM International Executive Board entitled “Snapshots: How To Encourage Union Membership”. We were impressed with Tina’s article and with her permission, have reprinted it on page 5 of this issue of Libretto. 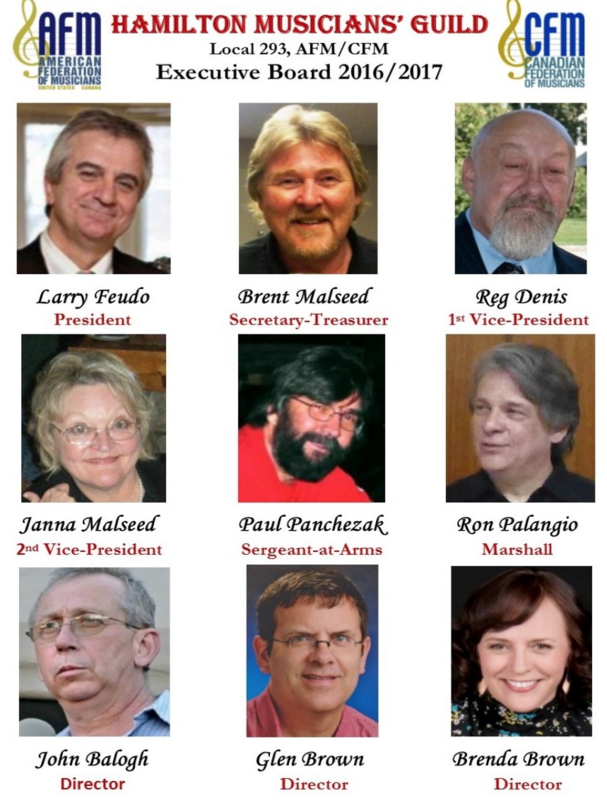 The Executive Board of Local 293 strives to accomplish the vision of the AFM Mission Statement by working together, organizing the unorganized musician, lobbying local politicians, building relationships with local labour organizations, networking with music educators, colleges and universities, negotiating fair agreements, raising industry standards and placing the professional musicians in the foreground of the cultural landscape. It is only by working together that we will have a meaningful voice in decisions that affect all musicians in our community. P2 Visa Process – The wait time for getting a P2 visa is currently quite long, as the U.S. Homeland Security office is backlogged. It is very important to make sure that you allow at least 90 days for visa processing. For those who need it, there is a type of P2 visa that covers a full year if, for example, you are making a recording in the U.S. with a number of sessions spread out over the year. Please see Robert Baird’s article on page 23 reprinted from the November issue of the International Musician. **IMPORTANT PROCESSING DELAY ALERT** US Immigration reports a P2 processing backlog. To avoid delays, submit your P2 package at lease 75 – 90 calendar days before your first show. MPTF – The community of Hamilton and area witnessed a great variety of professional talent throughout the Hamilton area this past summer with generous co-funding from the Music Performance Trust Fund. I was able to attend many of these concerts to snap some photos of our members which have been posted on pages 11 through 14 of this issue of the Libretto. General Membership Meeting December 7th – I hope to see you at the upcoming General Membership Meeting on December 7, 2015. This meeting will be held at the Hamilton Musicians’ Guild Board Room at 20 Hughson Street South, Suite 401, Hamilton. This is the first time we have held a meeting at our office location. The meeting starts at 7:00 pm and there will be someone at the front door to let you in from 6:30 to 7:00 pm. If you arrive after 7:00, you will need to dial 401 at the front entrance building security system and someone will come down to let you in (Instructions will be posted on the door the evening of the meeting). All the best to everyone during the holiday season and the New Year. Great to see longtime Local 293 member Jesse O’Brien back in the musical news. Jesse is a multiple nominee in this year’s Maple Blues Awards. As well as a much deserved nod in the “best piano/keyboard category” he is also nominated as “best producer” for his work on Harrison’s Kennedy’s latest CD, “This Is From Here”. Dave King, who we mentioned in our last Streetbeats column has been recognized as well for his work with Steve Strongman. He has been nominated in the “best drummer” category. We wish Dave and Jesse good luck in the final balloting. Speaking of longtime members, Local 293 Life Member Sonny Del Rio is on a roll it seems. Back in the spring family, friends and fans rallied to stage a benefit concert to raise money for some much needed dental work, without which sax playing would be impossible. The show was wildly successful and a substantial amount was raised. The Local helped out as well with a contribution from the A.F.M.’s Lester Petrillo Fund. The good news is that Sonny is back and playing better than ever. He staged a free “Thank You” show recently where he put the new choppers through their paces and a good time was had by all. On Sunday December 6 Sonny will be hosting his annual charity Christmas show at the Bay City Music Hall. Look for many surprise guests including Santa. After many years making other people sound good, Frank Koren finally gets to lend his considerable talent to his own career. Frank has just released his first solo effort, Red Chair, recorded at the world renowned Grant Avenue Studio. The CD is already reaping considerable critical acclaim. It’s about time Frank stepped to centre stage. One of the highlights of this year’s Music In the City series in Gore Park was the concert by Leonard, Burns and Dell on a beautiful summer afternoon. Sue Leonard, Cindy Dell and Brennagh Burns, all Local 293 members are putting the finishing touches on their brand new CD release. If you enjoy exquisite harmonies and strong songwriting you will want to keep an eye out for that one. Finally it was a pleasure to meet and speak to Dan Beck at the recent “Business of Music” seminar that Local 293 put on along with the screening of the documentary “Broke”. It was a rare opportunity to access someone with Dan’s experience and credentials in the music business. It’s even rarer when someone of that stature is so personable and generous with his time. A class act and an honorary member of Local 293. By the way, before we close the column for this issue, here’s a quick reminder: if you have a development in your musical career that you would like to see included in Streetbeats – an album release, the start of a major tour or a special concert or event– drop us a line at the Local 293 office and we’ll share the news with your union brothers and sisters. The AFM has been recognized by both US Citizenship and Immigration Services (USCIS) and Citizenship and Immigration Canada (CIC) as an authorized petitioner for temporary work permits on behalf of AFM/CFM member musicians. For P1, P3 and O1 Consultations, AFM provides the consultation letter required by the USCIS, but does not supply USCIS forms (see here for more information: http://www.afm.org/departments/touring-travel-theatre-booking-immigration/visa-questions-and-answers). You may also access information from the USCIS website: http://uscis.gov/graphics/index.htm. Please note, at this time P2 permits are being processed within 75-90 days. Suddenly at the Carpenter hospice on November 20th, 2015,McDade, aged 81, beloved husband of Joyce McDade, passed peacefully after a challenging fight with lung cancer. Beloved Dad of Steve, Carol and her husband Paul. Loving Granda of Emily and Lauren. Harry leaves behind many Scottish relatives. Harry was a well-respected pianist in the Hamilton/Burlington area. Also known for a great sense of humour. His main vocation was as an electrician, then upon retirement included piano tuning and restoration. At Harry’s request, there will be no visitation or funeral. Private family cremation has taken place. Donations to Carpenter hospice will be greatly appreciated by the family. Harry was a member of the Hamilton Musicians’ Guild for many years. Keeping proper financial records is a necessary task for anyone wishing to successfully pursue a career as a self-employed musician. This article is the second installment dedicated to musicians who are new to the business side of earning a living from their musical activities. You may be a person who works a day job and is issued a T4 at the end of the year by your employer plus you have self-employed income of which your paid activities as a musician may be just a part. Keeping the business records initially is fairly straight forward but requires discipline and commitment during the course of the year. Tax evasion is the process of not paying your properly calculated taxes. It is a crime. Tax avoidance is a process of paying your properly calculated taxes where the taxes that you pay are minimized in accordance with Canadian tax laws. These laws invariably change almost every year as politicians vie for re-election and modify their social policies. Once every 18 months I get approached by someone who is looking for an accountant to help him with his taxes because he has not filed a tax return for five years. These people have inflicted on themselves a nightmare of their own creation. Do not be one of these people. You are required to keep a full listing of all revenues that you receive as employment income. If someone pays you for your services and they maintain their own set of books and that transaction is going to be recorded on their books then you also have to record it in your own accounting records. Keep a handwritten page or an Excel spreadsheet where you record all of the revenues for the year: the amount, the place, the time, and the person who paid you or is going to paying you. Maintain a copy or a photo copy of everything for which you received payment especially handwritten cheques before you deposit them. Add these receipts up to arrive at a total revenue for the year and give this figure along with the backup to your accountant. Do not provide totals by months because your accountant needs the total for the year to use in the tax return calculations. If you are a band leader or group leader on a gig and you pay side musicians then the best procedure is to record the money you received in total from your customer and then keep a record of the disbursements that you made to your side men for each job that you worked otherwise all of the money could be attributed to you by the CRA. Expenses: what to include – EVERYTHING – everything that applies to the effort you expended to generate the revenues that you earned. This is where tax avoidance comes in – maximize the expenses that you claim plus use any personal tax credits that are available to you. Try keeping a travel log of the kilometres that you drive for business. The current CRA rates for an expense deduction are $0.55 per kilometer for the first 5,000 kilometres and $0.49 per kilometer thereafter. The total kilometres resets to zero every January first. If you drive long distances, this expense total may exceed the total of all of the other individual auto expenses plus it provides a fairly irrefutable record of your business travel for the CRA. Try it for a couple of months and then pick whichever method offers you the higher expense deduction. HST is a topic for a different article. Your accountant can help you with this. If your total self-employed business revenue from all sources exceeds $30,000 a year you have to file an HST return. Your tax bill and your HST bill require two separate filings. Group your expense receipts by type of expense. Total them for the year and if you are subject to filing an HST return then have the HST for both revenues and expenses by each revenue and expense type already totaled for your accountant. One of my service providers stated a couple of months ago that he always considered that a good accountant saved him more than he cost. For earnings from self-employment, many musicians set aside a standard cash balance of 15% of their total receipts as a reserve to pay their income taxes at the end of the year. What percentage you set aside should match your tax bracket. If you have to pay HST then I suggest that you also set aside a reserve to pay for HST. This money is not yours so don’t play with it. Set up a separate bank account for business and another for the reserves if you have to. File your tax returns on time. Being late simply provides an opportunity for the CRA to charge you late fees and interest on overdue payments. This is the digital age, the CRA does not forget about you. For example; say that you owe tax for 2014 and do not file your return for 2014 on time then the late-filing penalty is 5% of your 2014 balance owing, plus 1% of your balance owing for each full month your return is late, to a maximum of 12 months. Government late fees and fines generally do not comprise a tax deductible expense. For my clients I offer some spreadsheets that they can use to initiate their own organized record keeping. The best way to keep your records is to simply jot them down every weekend as you complete the week’s activities otherwise you will tend forget what you’ve done and once you get in the groove it’s pretty straightforward. A little preparation time upfront can save you money and headaches down the road. Best regards to you in these endeavours and good luck with your musical activities. Copyright Kevin Mann Accounting. 2015. The union doesn’t do anything for me. “Okay, so you joined the union and nothing changed. Did you join the union, or did you simply send in your application and dues and get into the database? The union isn’t a cable subscription service. It’s more like a gumball machine where you drop in the coin but actually have to reach into the spout, pick out the gumball, and then chew it to get the full flavour of what you paid for. For more talking points when having a conversation about the union, check out the AFM Bylaws, Article 2 – Mission. The 2015 summer series of concerts was co- sponsored by the Waterfront Trust, the Downtown Hamilton BIA , the Dundas Cactus Festival, It’s Your Festival (Gage Park), Jackson Square, the Pan Am Games through the City of Hamilton and the Hamilton Musicians’ Guild, Local 293, AFM with co-funding from the Music Performance Trust Fund (MPTF).